Certified organic daily hand care. Moisturises, protects and repairs damaged or dry hands. Strengthens the nail and stimulates its regrowth, thanks to myrrh. 12 hours of moisturisation clinically proven. The hand cream moisturises, protects and repairs damaged or dry hands. Nails are strengthened and regrowth is boosted. 12 hours of moisturisation clinically proven*. *Corneometry test performed on 10 women after 12 hours. 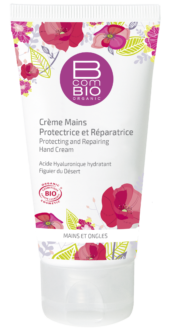 Apply Protecting and Repairing Hand Cream to the hands and massage the base of the nail. Water, Organic hazelnut oil*, Emulsifier**, Squalane (from olives)**, Glycerine**, Thickening agent**, Gelling agents**, Myrrh essential oil**, Vitamin E**, Sunflower oil**, Preservatives, Fragrances**. 99.5% of the total ingredients are natural or of natural origin. 95.8% of the total plant ingredients are from organic farming. Can be used throughout the day as often as necessary, particularly after washing. Massage in with circular movements of the wrists towards the nails.